BUSHY TALES is only a relatively new comic strip and, let's face it, "overnight success" is only the stuff of dreams. We are far more realistic than that. We are giving it a week! Seriously, it is only early days and we are working hard at doing the best job we can to get the word out and see what happens. Here are a couple of ideas on how you might be able to assist us…. • If your local, or favourite, newspaper does not run BUSHY TALES as one of its comic strips, why not drop the editor a friendly note (mail or email) requesting it? Editors are interested in what their readership wants, so it might help to get their attention. You could suggest the editor contacts us at [email protected] for further information. • Share the BUSHY TALES strip with others on Facebook and ask your friends and family to “Like” the BT Facebook page (www.facebook.com/BushyTalesComicStrip). This will enhance the profile of the strip and spread the word about it. We would love to have a growing online readership…and it will further increase the opportunities of print publication, too. Of course, if your newspaper does take the strip on, don’t forget to drop the editor a line and thank him/her! Positive comments are few and far between…but very much appreciated! 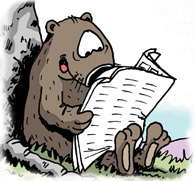 And thank you for your continued readership and enjoyment of the BUSHY TALES comic strip. Long may you enjoy it! BUSHY TALES is available in both Daily and Sunday formats. It is available in B&W, Greyscale and Coloured versions. It is available in CMYK or RGB and the files are sent in JPEG or TIFF formats (whatever fits best with your requirements)...and is sent via email, on CD, or uploaded to a Dropbox folder. BUSHY TALES strips will normally be provided on a monthly basis, though this can be tailored to suit your specific needs.